pandaphilia: Zhang Photography: Oh Snap! My roomie has a really nice professional camera and is really freaking talented with her photography. 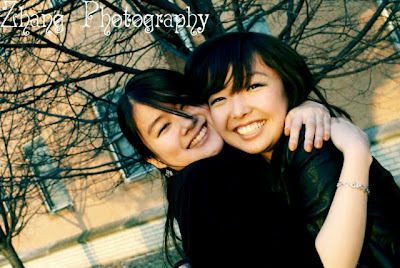 Check out her blog Zhang Photography for her beautiful pictures! Note: My photos are huger than usual because I played with the pixels. Just trying things out. The first photo is me in my originally green dress. Photoshop took care of that : ) I was not happy with my shoes that day because it was after the rain and the grass was super muddy so I ditched them for my converse. I placed the shoes on the bench next to me so it would dry and Lindsey snapped a picture. It's a cute artsy shot. I'm so happy oh so happy :D :D Jump shot! 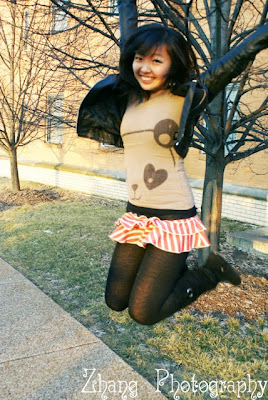 Biker jacket, panda shirt, bright mini skirt. I don't believe in matching. I love this one. 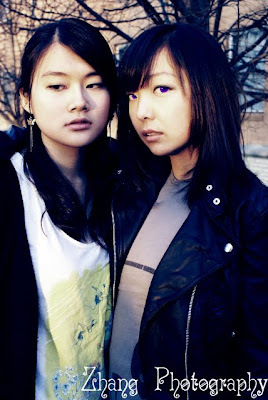 It's pretty hot xD She edited my eyes so that the purple contacts would stand out more. Meowmeow and me! 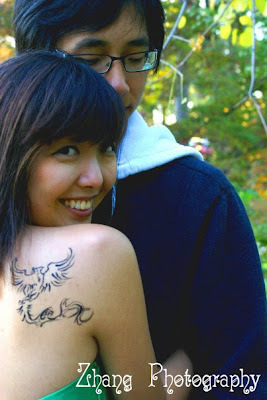 He did this phoenix tattoo for me in waterproof eyeliner lol. ***SAD STORY TODAY***. It's so amazingly sunny, warm, and gorgeous outside today so my boyfriend, suitemate and I went to Forest Park, which is near WashU. We walked to the St. Louis Art Museum as well and went inside. We admired a lot of pieces and I'll write a post about that later. I love the Impressionists, but most of all Monet's water lillies. Okay. The sad part. We were in the African Ceremonial Cloths exhibit watching the video on how they use the looms to make their pieces when I rubbed my eye and I felt my contact fall out and land on the floor. Disaster Number One. Then I couldn't find the bathroom because it's a very labyrinthine museum and they blocked off the normal exit for this exhibit. Disaster Number Two. By the time I got close, my contact dried up. Disaster Number Three. I even licked it (i know .. GROSS) to try to keep it alive but to no avail! Disaster Number Four for the licking. My favourite purple Circle Lenses are no more D*: !!! They only lasted 3 months wahhh and now I will have to reorder one. I hope EyeCandyLens allows just ordering one contact ... but then it won't come for another month and I won't have my purple Geo lenses to wear : ( Pout! So I stumbled back to the dorms, defeated and half blind. Oh well. At least we're going to go buy groceries again soon so we can make more yummy food. Yay! 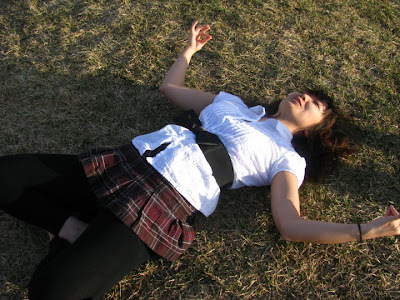 Me being weird and meditating on the ground in the Park. Notice the laughing. Meowmeow was happily running and doing cartwheels! I love this photo of him : ) I messed up the ISO though ... so everything is weirdly blue .. Enjoy the sunshine if you have a beautiful day at hand! I'm going to go buy me another contact. That is one COOL phoenix tattoo.